Climate-specific investment flows are growing, with US$ 268 billion invested per year from the private sector and US$ 96 billion per year from the public sector. While data from IEA and UNEP indicate at least US$ 0.7 trillion in incremental costs for the sectors outlined above, the Climate Policy Initiative estimated that approximately US$ 364 billion was invested globally in climate-specific project investment in 2011. Of this, US$ 14 billion was for adaptationn and the remainder for mitigation, chiefly for renewable energy generation (54% of mitigation investment), energy efficiency (18%), sustainable transport (10%) and other projects,o including land use, waste and fuel switching.50 The ratio of public to private investment was about 1:3 in 2011 (see Figure 8). Private sources of investment dominated, with approximately one-third of overall climate-specific investment originating from project developers. *Development financial institutions include national, bilateral and multilateral financial institutions. VC = venture capital; PE = private equity. 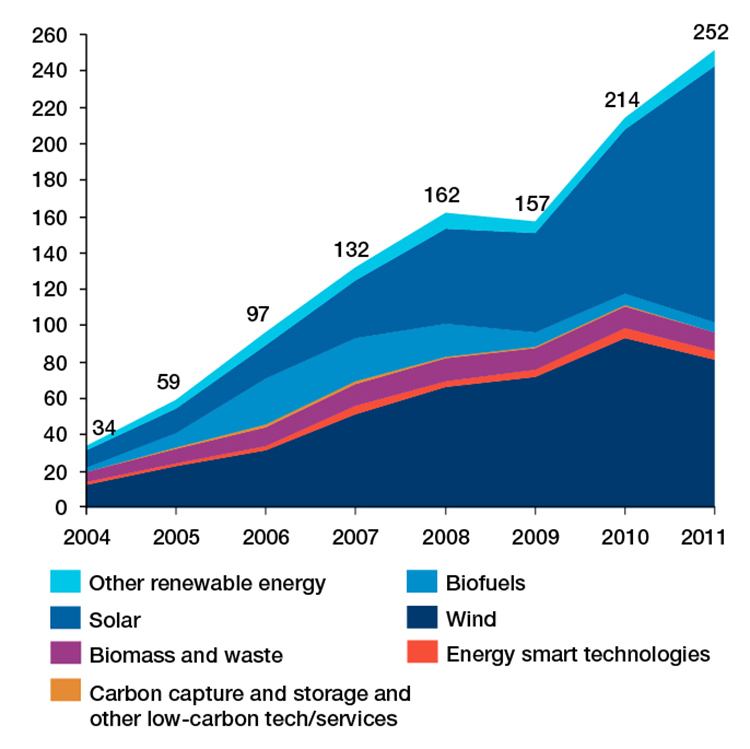 Investment in clean energy has rapidly grown over the past few years. In the longer term, the current revolution in shale gas could place downward price pressure on carbon-intensive energy sources, making renewables comparatively less attractive investments. While gas (which is less carbon-intensive than coal) will continue to be part of the energy mix in a green-growth scenario, its contribution will need to decrease over time to less than 3% of overall power investment needs by 2050, according to the IEA.55 Avoiding gas ‘lock-in’ will be a major challenge for governments in the coming decade. Global green investment could be accelerated by focusing more on developing country markets as a source of investment. Looking through a clean energy lens, investment in asset finance originating from non-OECD countries for both domestic and cross-border uses grew from US$ 4.5 billion in 2004 (19% of total asset finance) to US$ 68 billion in 2011 (41% of total asset finance), at a rate of 47% per year (see Figures 1.5, 1.6). 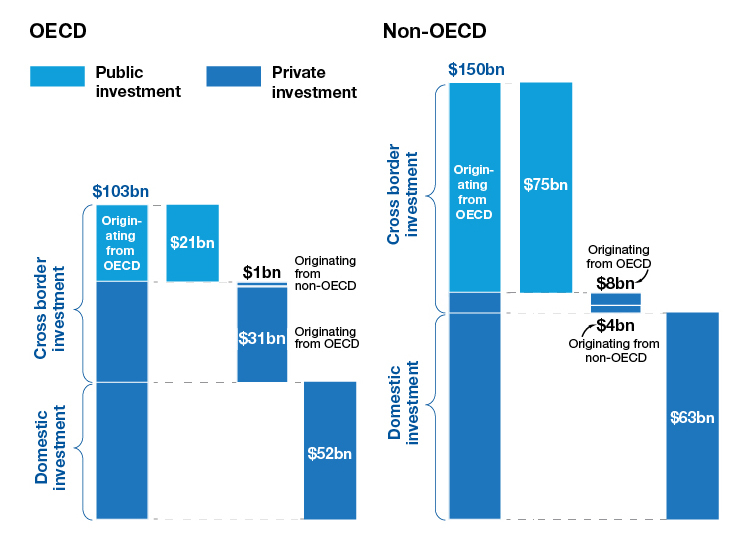 Foreign cross-border investment from outside the OECD represented the highest growth rate in any clean-energy flow category: 61% per year on average, a 28-fold increase.57 Based on current growth rates in investment originating in non-OECD countries, clean energy asset finance flows are expected to exceed those originating from the OECD in 2012. In the wake of the global financial crisis, investment originating from non-OECD countries did not slow as much as those from the OECD, highlighting their resilience and potential as a source of future investment for green growth. Note: Excludes the following private money flows: small-scale distributed solar photovoltaic investment (US$ 73 billion), venture capital/private equity/public markets/reinvested equity adjustment (US$ 13 billion), and other unknown private flows. Private finance flows include new-build clean-energy asset finance only. Public finance flows estimated by the Climate Policy Initiative (2012) and includes climate-change adaptation flows (total US$ 14 billion). Note: Data includes new clean-energy asset finance only, and excludes unknown flows, public markets, small distributed capacity (solar photovoltaic), venture capital and private equity funding and adjustments for reinvested equity. 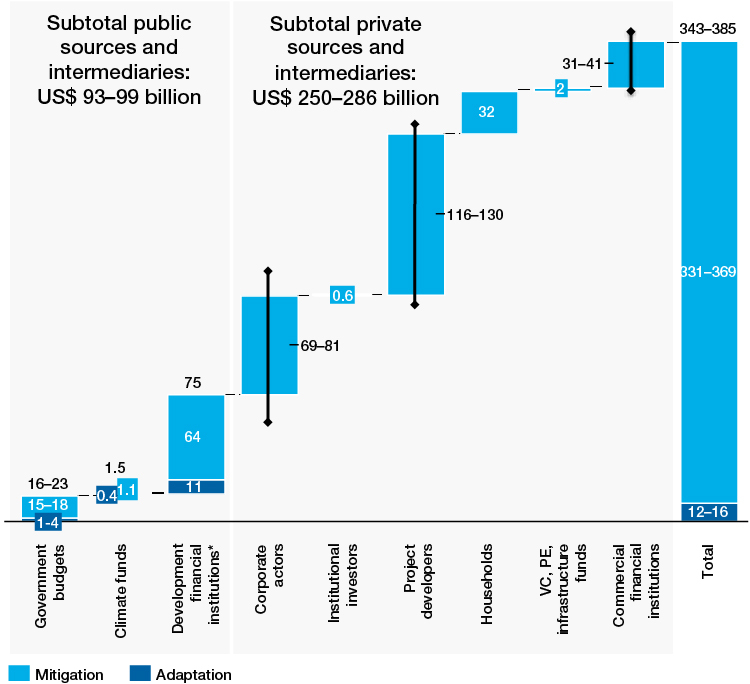 n Climate-specific investment flows for adaptation are estimated by the Climate Policy Initiative (2012) from various sources and include: agriculture and forestry; water preservation; supply and sanitation; infrastructure; capacity building/technical assistance; disaster risk reduction, and others. o Other climate-specific investment flows for mitigation include agriculture, forestry, land-use, waste and waste water, capacity building/technical assistance, fuel switching and others. 50 Global Landscape of Climate Finance, 2012, Climate Policy Initiative; http://climatepolicyinitiative.org/wp-content/uploads/2012/12/The-Landscape-of-Climate-Finance-2012.pdf. 51 Global Landscape of Climate Finance, 2012, Climate Policy Initiative; http://climatepolicyinitiative.org/wp-content/uploads/2012/12/The-Landscape-of-Climate-Finance-2012.pdf. p Clean energy asset finance as reported in the Bloomberg New Energy Finance database. Scope includes the new-build financing of renewable energy-generating projects, which includes both electricity generating and biofuels production assets. Projects may be financed via the balance sheets of the project owners or through financing mechanisms, such as syndicated equity from institutional investors, or project debt from banks. 52 Bloomberg New Energy Finance Asset Finance Database, 2012.
q Germany, the UK and Spain are examples where solar photovoltaic feed-in-tariff rates and subsidies have been reduced, while in the USA, wind installations are falling, due partly to the federal Production Tax Credit expiring. India and China are also phasing out tax incentives for wind energy. 54 Q2 2012 Clean Energy Policy and Market Briefing, 19 July 2012, Bloomberg New Energy Finance; http://www.bnef.com/WhitePapers/view/114. 55 Energy Technology Perspectives, 2012, IEA. r Public markets: Funds raised by publicly quoted or over-the-counter/off-exchange trading (OTC) supported clean energy companies on the capital markets; Venture capital and private equity: Early- and late-stage venture capital funding rounds of clean energy companies as well as funds raised privately for expansion; Small distributed capacity: Estimated data of non-tracked investment in small scale solar photovoltaic (<1 megawatt). Data sourced from Bloomberg New Energy Finance, 2012. 56 Bloomberg New Energy Finance Asset Finance Database, 2012. 57 Bloomberg New Energy Finance Asset Finance Database, 2012. 58 Bloomberg New Energy Finance Asset Finance Database, 2012. 59 Global Landscape of Climate Finance, 2012, Climate Policy Initiative; http://climatepolicyinitiative.org/wp-content/uploads/2012/12/The-Landscape-of-Climate-Finance-2012.pdf. 60 Bloomberg New Energy Finance Asset Finance Database, 2012.